Heavy duty plastic garage funnel with a steel filter that helps remove solid contaminants from fu..
Green Plastic Fuel Can 5 Litre. Manufactured from durable HDPE, and comes complete with a flexi..
Black Plastic Fuel Cans 5 Litre. Manufactured from durable HDPE, and comes complete with a flex..
Red Plastic Fuel Cans 5 Litre. Manufactured from durable HDPE, and comes complete with a flexib.. This jerry fuel can spout attaches onto either the 10 or 20 litre jerry fule cans, to aid pouring..
Green Jerry Can 5 Litre. Manufactured from 0.9mm pickled steel sheet with a fuel resistant..
Green Jerry Can 10 Litre. Manufactured from 0.9mm pickled steel sheet with a fuel resistan..
Green Jerry Can 20 Litre. Manufactured from 0.9mm pickled steel sheet with a fuel resistant lin..
Red Petrol Can 5 Litre. This metal petrol can (or paddycan) is used for transferring flammable ..
Red Petrol Can 10 Litre. This metal petrol can (paddycan) is used for transferring flammable li..
Red Jerry Can 10 Litre. Manufactured from 0.9mm pickled steel sheet with a fuel resistant linin..
Red Jerry Can 20 Litre. Manufactured from 0.9mm pickled steel sheet with a fuel resistant linin..
Yellow Explosafe Petrol Fuel Can 10 Litre. This explosafe fuel can is packed with a honeycomb ..
Telescopic Drum Pump. For transferring lubricants from 60 litre to 205 litre drums. This te..
Our fuel cans are robust fuel containers, manufactured from either pressed or heavy gauge steel or durable HDPE. These durable materials allow the can to transport highly flammable liquids, safely. 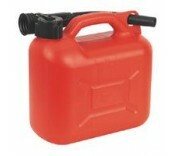 Our range of fuel cans starts with a 5 litre can and rises to the larger capacity 20 litre jerry can. Our 5 litre fuel cans are colour coded for different fuels and the 10 litre and 20 litre fuel cans are TUV approved. We also stock a pour spout which can be attached to either the 10 or 20 litre jerry can. Again this spout just enables the distribution of fuel to be carried safely. Our range of fuels can includes 5 litre plastic fuel cans, 10 litre metal paddy cans (petrol cans) and 20 litre jerry cans. These fuel can can be used for a wide variety of industrial or domestic applications.